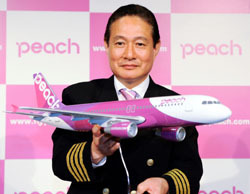 The operator of Japan’s newest budget carrier announced Tuesday the airline will operate under the brand name Peach. The company also changed its name to Peach Aviation Ltd. from A&F Aviation Co. The company said it chose the name based on the fruit’s Asian origin and because it invokes a youthful, energetic and generous image. To embody the image, the carrier’s aircraft will be painted pink and fuchsia. Based at Kansai International Airport, the low-cost carrier plans to start domestic flights next March, connecting Fukuoka and Sapporo. International flights between Kansai International and Seoul are expected to start next May. The company said it plans to increase the number of employees from the current 50 to around 200 by the end of fiscal 2011. Inoue declined to disclose the planned ticket prices but said they will be substantially lower than those offered by major carriers. “It’ll be meaningless if we don’t offer the prices that no one has seen,” he said. The Kansai-based carrier was founded in February with a total investment of some ¥30 million from All Nippon Airways Co. and Hong Kong’s First Eastern Investment Group. With Innovation Network Corporation of Japan joining the group in March, ANA, First Eastern, and INCJ now hold 33.4 percent, 33.3 percent and 33.3 percent of the carrier’s shares respectively. Peach Aviation will be the first Japanese low-cost carrier to operate from Kansai International.